Off topic [you'll see why here in a minute] this last year I have taken more of an interest in my health and fitness. While I am pretty modest about my health and fitness regime as I do not want to be held accountable for when I do fail, I wanted to share with you a program that I've started recently by Beach Body called Focus T25. The "T" stands for Shaun T who is the coach throughout the exercises and the 25 stands for how many minutes a day you need to devote to the program. Back on topic, contrary to what you are probably thinking thus far, this post is not about fitness nor will this blog turn into a fitness blog. Fitness is a part of my life but it is not my life. I didn't put much thought into the "Focus" part of my new workout's title nor did I really quite understand it at the beginning. I just knew many people were having success in keeping up with this routine. I started this workout on a Monday. I was all excited. After doing the workout, I wanted to die but at the same time I really didn't quite feel sore and tired afterwards like I should have. I thought, "WOW. That was easier than I thought it would be. I could do this everyday. Easily. Boom. I've got this." Tuesday, I popped in another workout DVD and once again, it was pretty easy. I still didn't find myself overly worked, tired or sore. By this point, I am slightly concerned because these videos were pretty intense, but I wasn't feeling like my body was getting the workout it should have. So, back track to the title of these workouts, FOCUS T25. I decided to look into what the "focus" really meant. Maybe I was missing something. I sort of tend to tune out the instructor in workout videos most of the time. I mock the movements based on what I see the people doing in the background. I decided that maybe it would be a good idea to actually listen to what Mr. Shaun T actually had to say. I quickly noticed that he says "focus" a lot. I mean, a lot. It's like OK, we get it, we are focused. No, that's not the point. The point is, you HAVE to focus. You have to focus on each move separate from the entire workout. You are suppose to give each exercise everything you've got to give. So, I started doing these workouts with a new approach. When I would start a new exercise I put my entire mind and body into the movement. There was no thinking about anything else or giving up any kind of slack whatsoever. As I focused more on the exercises and put a lot more effort into them, I started to notice my body being a little more sore and actually worked compared to the way I felt previously. As the next few weeks went by, I continued to put more focus into my workouts. I'm not saying that I will be rocking a bikini with a six pack anytime soon if ever in my life as that is not my goal or desire, but I do feel a little bit stronger and I have noticed some tone in places I've never seen before. Changes only I will probably only ever notice but that's all that matters. I started seeing results because I actually FOCUSED on what I was doing. As usual, I started to think about this new program and the main objective of: FOCUS and how I could apply it to other aspects of my life. I began thinking about all the things that I have taken on these last few years. All of the unfinished projects and hobbies. There are some days I, and I am sure you as well, wake up wondering where to even begin. I realized that I had way too many things going on in my life but none of them were actually getting accomplished let alone completed. I use to think that I was never getting anything done because I worked all the time for someone else. After leaving my job and working for myself this last year, I noticed these things still were not getting done. It wasn't the job. It was me. My priorities. My priorities were out. of. whack. I decided that we, as human beings in this modern day world take on way too many things at once. We find time to do some things but yet don't find the time to do others. I decided that I am going to finally make time for the things that matter most. Even with my new job, I am going to FOCUS on those things and those things only. I plan on starting off small with the things I really want to accomplish and slowly add a few more things into my life. 1. Reading books. Even if it's just 20 minutes to a half hour before bed every night. 2. Exercise. Whether it's Focus T25 or just going for a walk. 3. Making a once around in my landscaping to water and pull weeds. 4. Daily cleaning routine. I've been slacking on this since I started my new job. It's not hard. It's 15-20 minutes a day. I need. To. Focus. 5. Playing with my puppy. 6. Writing/Blogging. Once again, I've really slacked since I started my new job. I need to find a good time to focus on this in my weekly routine. 8. Taking pictures. That last time I took a picture of our corn it was knee high. It's now tasseling. Oops. So much for documenting the corn growth stages this summer. You may think that my list isn't very big or busy but I struggle getting these things in on a daily basis. These are the things I lie in bed at night thinking about how I didn't do them. I put other things before them instead of making what I really want to do a priority. 2. Social distractions. Hanging out with friends and family is very important. But I have a hard time saying no. Very hard time. I need to learn to say no once in a while and commit to my me time. 3. Window shopping. I'm the type that if I need a tube of toothpaste, I will peruse the store for an hour before I grab the toothpaste and go. I'm the same way online. I could window shop for things I will never buy for hours. 4. Defending myself and my beliefs. Bashing what I hate. I spend way too much time researching and defending some of the things I believe in. I am going to focus on promoting what I love instead of bashing what I hate. Who has time to hate? 5. Working around the house. The honey-do list needs to go on hold for a while. We planned a wedding. Built a house. Life is good. The rest can unfold later as needed. It's amazing how we can let things that don't really matter to us consume so much of our time. I am pretty proud to say that I don't have T.V. on my list of things I put above my priorities but I know some of you do and I know at one time I could have had that on my list. I am going to challenge you to think about all the things you don't do that you wish you did do. Think about the things you do instead. Think about what's really important to you in this short life. Find your priorities in life and focus on them. Let's focus, give it all we've got and get the most out of our lives. I love this post, Kelly! It's so important to actually FOCUS and pour ourselves into the important things in our life---to live intentionally with focus. Awesome message! 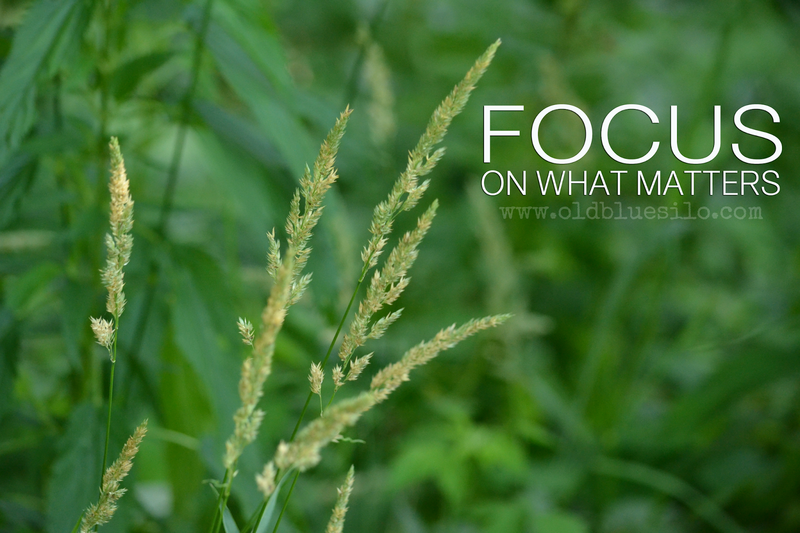 We all tend to lose focus on what really matters. Daily. I hope to get better at keeping focus as time goes forward! If I mis-read it, or you intended it that way,I truly apologize for questioning your spelling. Great post Kelly! I swear I keep looking around my house to find you because we keep thinking the same thoughts! I'm trying the beachbody thing too, but I slacked off when it started to hurt. I need to work through the pain, but I am going to do it gradually. Calves go to the fair Wednesday, and we show on Friday. I will have my Farm Bureau hat on at least one of those days if not 2-3, and then we auction on Monday. There are three days of appointments, and then we skeedaddle off up to Wisconsin for a vacay getaway with the girls. The girls start back to school about 3-4 days after we get back. I'm tired just typing that! I love this post + the push for focus! I definitely have been feeling very scattered lately + I know it's because I'm trying to do too many things all at once. "Defending myself and my beliefs. Bashing what I hate." -- This is a big distraction for me, and I tend to get caught in internet wormholes for hours researching information that, really, I could do without. Thanks for the reminder to stay focused on what matters most! Kelly, this is where I am at right now. About a month ago I started looking at all my volunteering. I am cutting back to only focus on volunteering that directly impacts my kids at this stage, like 4-H, Sunday School and FFA and not as much of the numerous other business and economic development I love also. I also have taken the Facebook app off my phone most weekends starting this past winter but now am removing it all together. I need to focus with a similar list like you! Keep me posted on how it goes and I'll do the same with you. I am thinking of it as a reset!